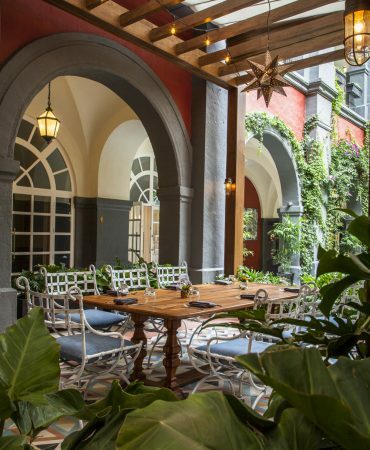 Home / Restaurants / Zanaya at Four Seasons Hotel Mexico D.F. Zanaya at Four Seasons Hotel Mexico D.F. 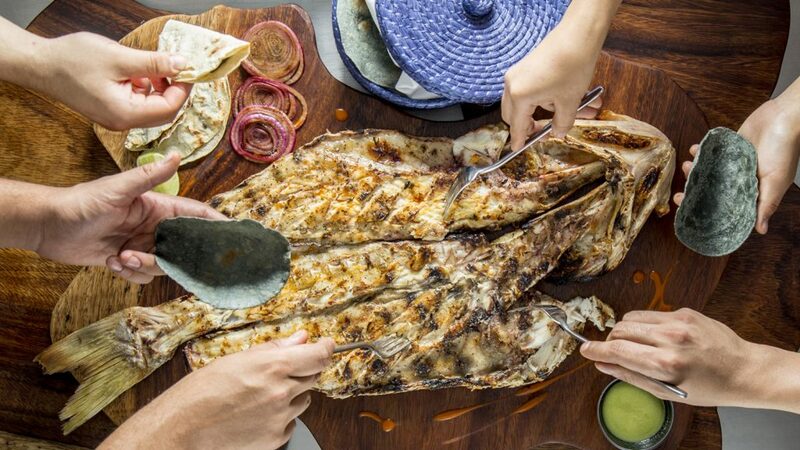 The newly opened Zanaya restaurant in Mexico City’s Four Seasons hotel takes its name from the first letters of a traditional grilling method (ZAranda) and the region in which this was used (NAYArit). 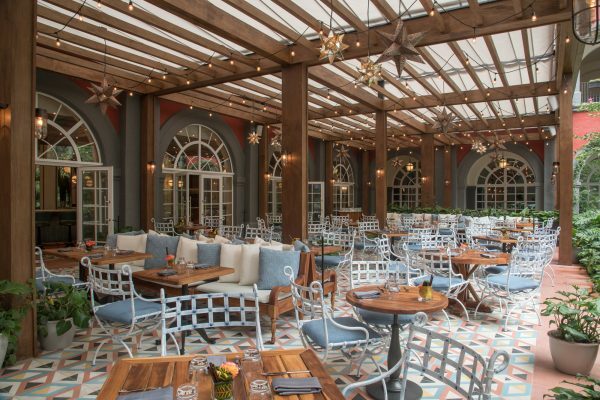 This fusion of words is reflective of the restaurant as a whole; within the bustle of Mexico City and the classic luxury of the Four Seasons hotel, Zanaya offers a relaxed and informal space in which to enjoy the cuisine of the distant Pacific coast. 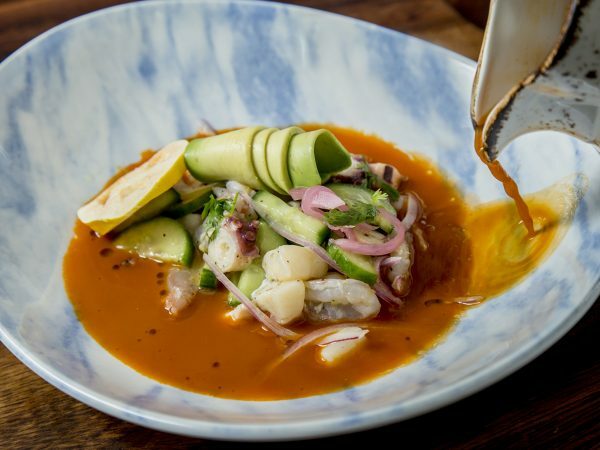 In his first Four Seasons venture, Chef Tonatiuh Cuevas combines youthful innovation with the traditions of pre-Hispanic Mexican cuisine and delivers a menu of sophisticated but punchy dishes. 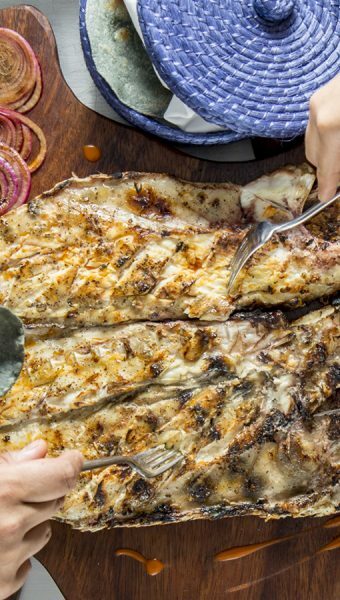 Ingredients are sourced from the region and fish is flown in fresh, daily, from the state of Nayarit after Cuevas insisted that freshness was a key aspect of the traditional recipe. The culmination of the project was the installation of the traditional wood-fired brick oven, the zaranda, in the Four Seasons kitchen, a necessary feature to remain faithful to the 500 year old traditions from which the cuisine draws, but a definite challenge in terms of adapting the existing kitchen and ventilation to remove the copious wood smoke. Our evening at Zanaya began, as all evenings in Mexico ought, with cocktails. Award-winning mixologist Mica Rosseau is on board in the hotel’s destination bar Fifty Mils, but his flair is also apparent in the creations for the restaurant. An ‘Extraordinary Margarita’ was lifted to new heights by the addition of Aperol, Cointreau and cardamom, while the warming and smoky ‘El Guero’ featured mezcal, amaranth syrup and cactus bitters. Our waiter, Job, was on hand to recommend a variety of cocktails and, along with restaurant manager Emily, was happy to explain details of the dishes throughout the friendly and efficient service. 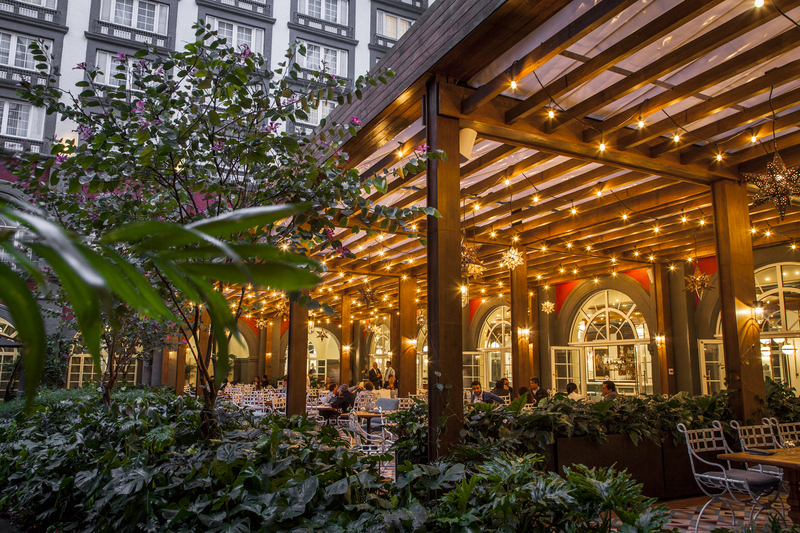 We sat outside, as the canopy of lights made the atmosphere quite magical and the Four Seasons courtyard became more buzzy as the evening progressed. We began with a tasting platter of six salsas, ranging from herb-infused to quite spicy. 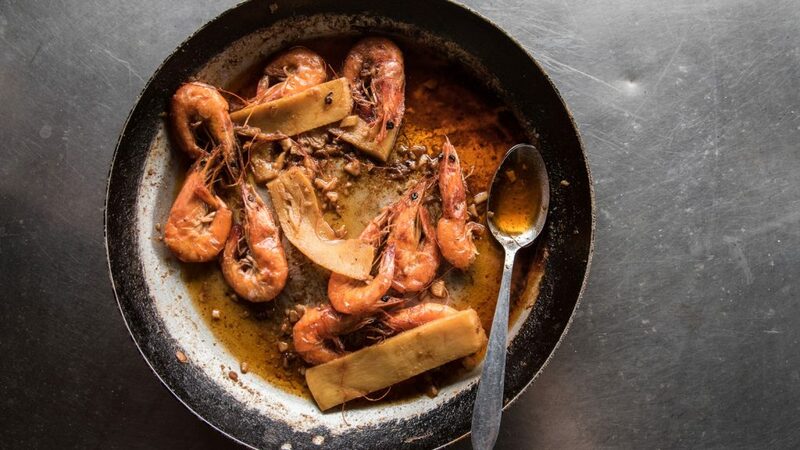 If you like spicy food as we do, this is a good place to start. Elsewhere, Mexican restaurants often have to be prompted to bring out spicy salsa for European or US customers, but the salsas are diverse in flavour and must be tasted in as many varieties as possible – just be tentative with your first bite as some are extremely hot! We chose three plates from the starter selection, tender octopus tacos with a smooth cheese filling and smoky flavour, aguachile (like ceviche but with more punch) with kidney scallops, red onion and cucumber that had a very acidic freshness and, finally, crispy ‘Tecuala’ tail-on shrimp, basted in butter and chili paste so that their shells became crunchy and their sweet flesh was infused with the spicy, smokiness of the sauce. 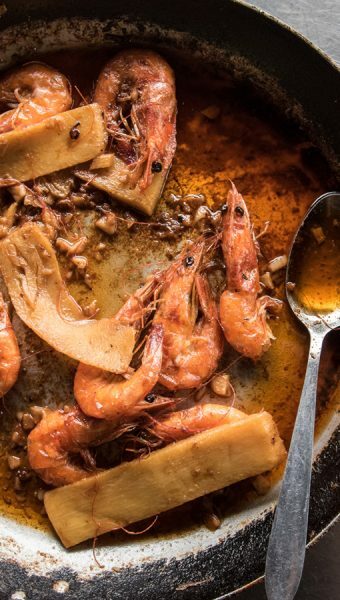 When Emily passed by to see how we were doing, I heard myself rapturously proclaiming these shrimp to be one of the best things I have ever eaten. 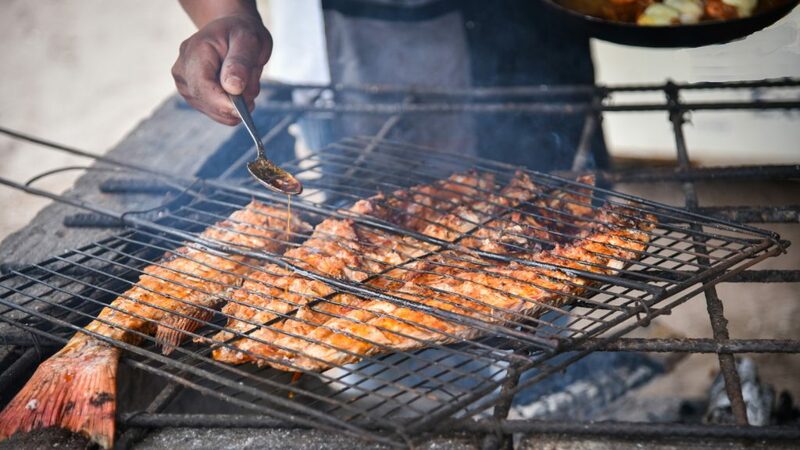 Determined to try out the speciality of the house, my dining partner ordered the zarandeado fish with guajillo chili (grilled on the zaranda with a rub of various spices). This can be ordered for more than one and arrives with corn tortillas, red onion and salsas so you or your group can prepare their own tacos. The fish was succulent and full of complex layers of spice that were set off beautifully by the sharp salsa sauce. 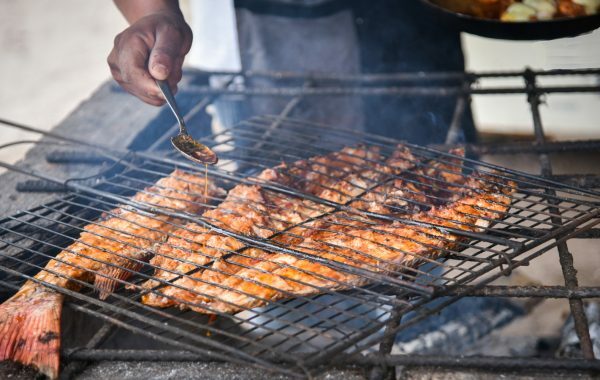 As I had experienced the zarandeado fish on a previous visit to Mexico, I opted for something different – though I definitely stole a few bites anyway. My choice was chili ash crusted tuna, which came perfectly seared and pink in the middle, with pickled pineapple, jicama (a Mexican tuber somewhat like a yam or turnip), melon and dried shrimp. The coating of ash was slightly gritty but provided a earthiness that bound together the brighter fruit and chili flavours. The wine suggested was again of Mexican provenance, a Monte Xanic chenin blanc from Baja California which was not sweet but contained fruity flavours such as melon and pear, with a citrusy finish. We also ordered a side of Cora rice (using the traditional spicing combinations of the indigenous Cora people of Nayarit) which was delicious but unnecessary, given the portion sizes. My dessert, a chocolate tart, was very tasty – although, as a chocolate purist, I may not have ordered it if I had known that the tart was made of chocolate and filled with spiced pineapple marmalade rather than the marmalade being on the side. Nonetheless, the combination of flavours and textures was interesting and there was enough chocolate in the sauce added at the table to satisfy my cravings (until the next meal!). On the other side of the table, the ‘sphere of coconut and mango’ had an unusual appearance as a collection of round things, including a huge disc of caramel or dulce de leche ganache and a mango jelly ball rolled in coconut. After reaching the end of dinner, both of us were rather reluctant to leave the restaurant but resigned ourselves to this course of action until waiter Job convinced us to stay for one more. This naturally became several more, accompanied by a discussion about the merits of the espresso martini (with rum) and a list of tips for enjoying the city. Job was the paragon of service and made us feel completely at home. The fusion of old and new, innovation and tradition, is part of what makes this restaurant exciting, but this contrast is also something that exists throughout the city. 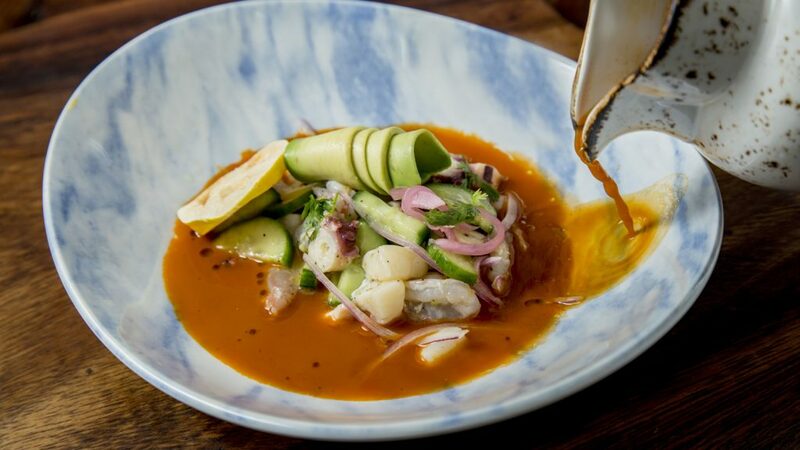 A great deal of effort has gone into creating a dining experience that provides the city with the experience of regional cuisine and reflects the vibrancy of modern Mexico. As a destination that welcomes local people for business or pleasure, as well as guests at Four Seasons Hotel, I look forward to seeing how this restaurant continues to develop and, most of all, I look forward to coming back. 06600 Ciudad de México, D.F.